Today I am going to review a book that I didn't care all that much for. "Breaking the Arm, Healing the Heart", is a really confusing read. It jumps around so much and the characters are always going back and forth that the reader gets lost in between the lines. The characters are enemies, but they magically start falling for each other. It felt like the author was trying to do a Romeo and Juliet thing, except the part where they die and their families are mortal enemies. Instead of families being enemies, the main characters friends are. Don't get me wrong it had some funny parts to it, but it feels like it leaves the reader lacking and confused. "Sun Coast and Marina are rival schools, and the former's head cheerleader, Sicily Carmichael, just broke the arm of the latter's star player, Lucas Mercer. Now, she has to “babysit” him on a regular basis and abide his every request. Being archenemies, the task isn’t exactly a piece of cake, no matter how attracted they are to one another." There isn't much more I can say about this book, except I was very disappointed in it and felt not only was it confusing, but it felt rushed. I didn't like this book, but to each his own I guess, and if it grabs your attention, who knows, you might like it. All I can say is it didn't do anything for me, but we all have different books we love and different books we don't like. 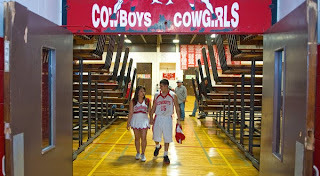 It also kinda reminded me a little bit of High School Musical, except they didn't sing and they were on different teams.